Happy Monday! I was a total slouch this week and did not actually finish Miss Peregrine's Home for Peculiar Children. I blame the new job. My daily routine has been completely overhauled (in a good way), but I haven't gotten my equilibrium back quite yet. I'll get there. It's just going to take some time. Needless to say, no new book this week. I'm still working on Miss Peregrine's, and I'm hopeful I'll have my act together by next week. So instead of talking about what I'm reading, I thought I'd tell you about what I'm watching. I would have started with Community, but apparently NBC has it out for the best show on TV right now (yeah, I said it). So instead, I'm going to talk about one of my other favorite shows, Raising Hope. The show follows the Chances, a lower, lower, lower middle class family (their description). At the center is son Jimmy (Lucas Neff) who, through a ridiculous turn-of-events, had a one-night stand with a serial killer and is now a single dad to daughter Hope. His parents, Burt (Garret Dillahunt) and Virginia (Martha Plimpton), are just as clueless about raising a little girl, but like Jimmy, they are doing their best to build a happy home filled with love. And then there's Maw-Maw (Cloris Leachman), Jimmy's great-great grandmother who suffers from "old-timer's" disease and is constantly confusing reality with her own crazy imagination. 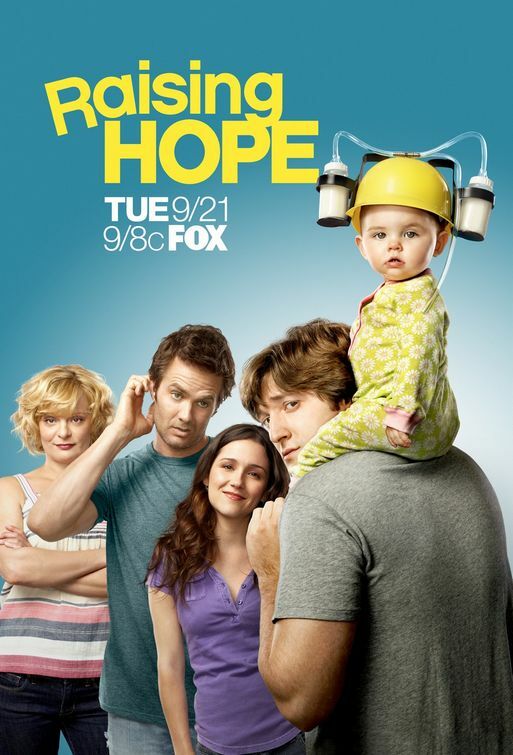 Raising Hope has a lot of heart and is filled with quirky charm. It will make you laugh, but in a very good way. The Chances may not have much ("Health insurance? Let me go get the butler - I think he left it in the hot air balloon! "), but they make the most of every situation and share a lot of laughs along the way. They encounter some bumps - Hope gets trapped in the storage shed where Virginia hoards all of her junk, Burt has to seduce a long-lost relative, and their best family photo was taken when they ran a red light - but through it all, the Chances stick together and still manage to find joy. They may be downright crazy, but they're also loveable and endearing. You can't help but root for them! Oh, and did I mention they have a cousin who joins a reserve-gender polygomy cult? Nothing says funny like "brother husbands." And yes, they totally sing a song about brother husbandly love. 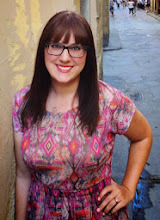 If you haven't yet, I would highly recommend checking out Raising Hope. It's only in its second season, so there's still plenty of time to catch up (and season one is available for instant streaming on Netflix). Tone-wise, I would liken Raising Hope to Parks and Recreation. It focuses on people in less-than-ideal circumstances, but rather than highlighting how bad life is, it manages to be quirky, charming, and a lot of fun. Even in the worst circumstances, Raising Hope reminds us that there is still so much joy to be had. This show will warm your heart and make you laugh. What TV shows are you watching these days? Any good recommendations? Is anyone else as enamored with the quirky Chance family as I am? I haven't ever watched Raising Hope, but it sounds funnier than I expected! I tend to only discover shows after they've gone off the air, so right now I'm totally obsessed with Big Love. So dramatic! Do it! You will not regret it! :) And I'm very similar - I didn't watch any Friends until it had long been off the air (crazy, right?). And I totally went through a Big Love phase, though I don't think I seen anything from third season onward. Maybe I have to go back now. It's pretty intense! My friend recently told me to watch it, I've only seen one episode, but it was really funny. Raising Hope is one of my favorite shows too! I like that they keep making jokes about how TV shows about babies never last very long. I also wholeheartedly agree with what you said about the tone being similar to Parks and Recreations, "It focuses on people in less-than-ideal circumstances, but rather than highlighting how bad life is, it manages to be quirky, charming, and a lot of fun." I think that is one of the reasons that I like P&R, but not the Office which takes a more bitter look at the world. I would like to put in my recommendation for Raising Hope as well, especially to anyone who liked My Name is Earl (it's made by the same people, and some of the same characters how up there too, like the day time stripper). Also, NBC needs to bring community back right now. I heartily agree! I love the self-referential humor on Raising Hope - it really doesn't take itself too seriously, which I love, and its comedy is so much more fun. The Office is too mean for my taste, and I definitely love the feel-good nature of Raising Hope. And thanks for the suggestion - I'm definitely going to check out My Name is Earl!